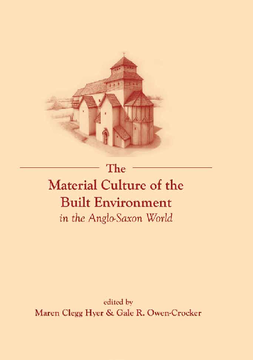 The Material Culture of the Built Environment in the Anglo-Saxon World, second volume of Daily Living in the Anglo-Saxon World, continues to introduce students of Anglo-Saxon culture to aspects of the realities of the built environment that surrounded Anglo-Saxon peoples through reference to archaeological and textual sources. It considers what structures intruded on the natural landscape the Anglo-Saxons inhabited – roads and tracks, ancient barrows and Roman buildings, the villages and towns, churches, beacons, boundary ditches and walls, grave-markers and standing sculptures – and explores the interrelationships between them and their part in Anglo-Saxon life. Maren Clegg Hyer is Associate Professor of English at Valdosta State University (Georgia), and specialises in researching material culture, including textiles and textile imagery, in Anglo-Saxon England. Gale R. Owen-Crocker is Professor of Anglo-Saxon Culture at the University of Manchester. She is editor of 'Working with Anglo-Saxon Manuscripts' (University of Exeter Press, 2009). Dr Maren Clegg Hyer is Associate Professor of English at Valdosta State University (Georgia). She specializes in researching textiles and textile imagery in Anglo-Saxon culture. Some of her recent publications include 'The Material Culture of Daily Living in Anglo-Saxon England' (edited with Gale R. Owen-Crocker, Exeter 2011); 'The Material Culture of the Built Environment in the Anglo-Saxon World' (edited with Gale R. Owen-Crocker, Liverpool 2015); and 'Textiles, Text, Intertext: Essays in Honour of Gale R. Owen-Crocker' (edited with Jill Frederick, Boydell 2016), including a chapter in that volume, "Text, Textile, Context: Aldhelm and Wordweaving as Metaphor in Old English." Gale R. Owen-Crocker is Professor of Anglo-Saxon Culture at the University of Manchester. She is editor of Working with Anglo-Saxon Manuscripts (University of Exeter Press, 2009).